Yay! Creative Inspirations is back and I’m delighted to be featuring Sophia & Matt, designers of beautiful prints, bags and accessories. In fact, there’s so much to tell you about them that I’ll be sharing their story in not one, but two posts. In Part 1, I’ll be talking to Sophia & Matt about their company. In Part 2, you’ll have a chance to find out more about the couple behind the company, (as well as the chance to win a Sophia & Matt makeup bag). I discovered Sophia & Matt long before I started blogging. In fact, I stumbled across their Greenwich store four years ago, when Mr T and I were visiting London for our first C2C Country Music festival at the O2 Arena. 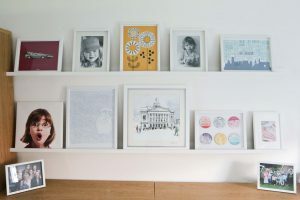 When I walked across the threshold of their little Greenwich store, I immediately fell in love with their colourful print designs and beautifully crafted products. On closer inspection, I quickly realised these weren’t mass-produced bags and accessories but something special. There was such attention to detail in terms of product design such as the beautiful linings, high-quality metal fastenings, neat double stitching and piped edging. 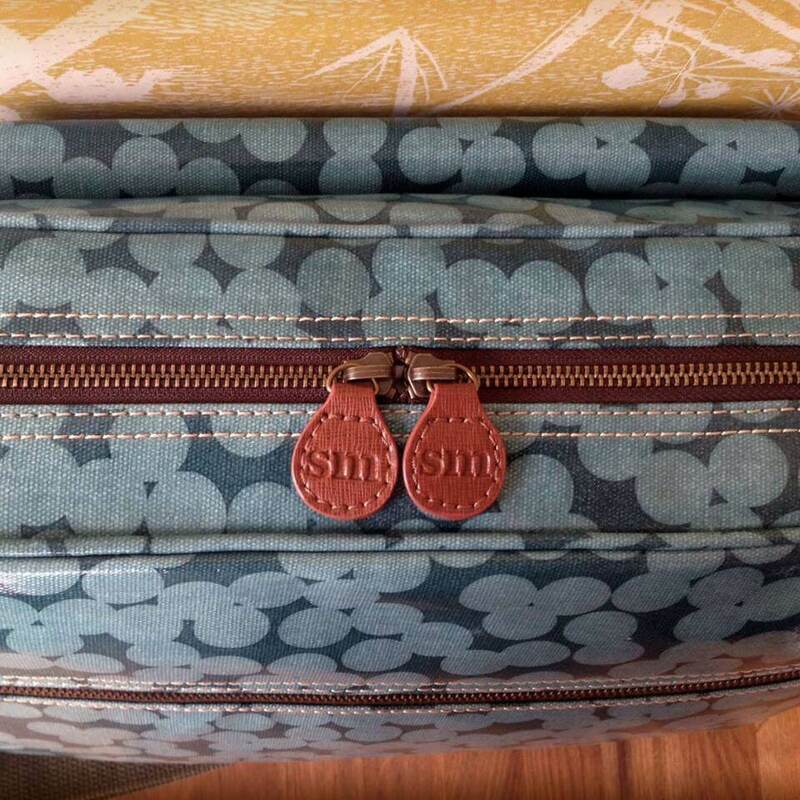 Everything was perfect, from the little tags on the zippers to lovely labels and branding. 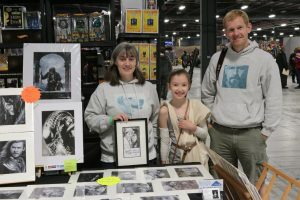 I wanted to find out more about Sophia & Matt so I had a long chat to the shop assistant and learned a little bit about their fascinating story: from their first stall on Greenwich market to this little shop around the corner. Of course, I wanted everything in the shop! Instead, Mr T treated me to the first of many Sophia & Matt products, the large Mainline washbag in Yayoi print. We also bought my mum a gift to thank her for looking after our girls for the weekend. It was the beginning of a special tradition. Every year since then, we’ve attended the C2C festival at the O2, visited Sophia & Matt’s Greenwich store and bought something for me and for mum. Sophia & Matt, in their own words. Sophia & Matt’s last day on Greenwich Market Store. After stalking them for months, I’m delighted Sophia & Matt agreed to be the subject of my Creative Inspirations series. Not only because I’m super-nosey and wanted to find out more about them, but because I think you are all going to fall in love with them too. 1.Tell me about Sophia & Matt. Well, we’re Sophia & Matt. We live and work in Brighton. We studied together for 3 years. We’ve run our company together for 11 years and been a couple for 18 years. 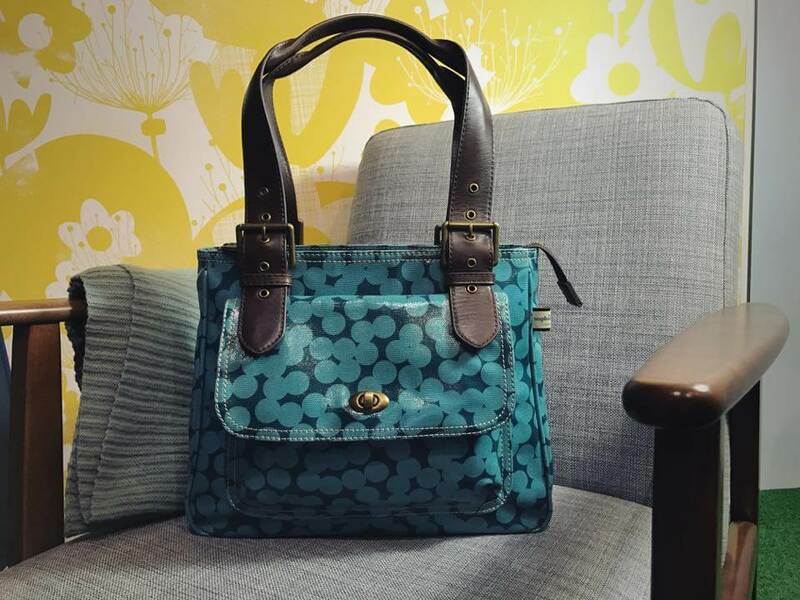 We’re print/product designers and we make handbags and accessories. 2. How did you both meet? We met at art college when we were 16. We shared a locker at first, then became friends, and a year later (1999) we became a couple. We studied art together for 3 years. Then we spent another 3 years specialising in our preferred fields. Matt’s degree was in graphic design at Ravensbourne and mine was in fashion design at KIAD. 3. Can you give us a potted history of the ‘Sophia & Matt story’ from your 2005 to now? 2005 – We started our company, hand cutting and sewing handbags and wash bags at my parent’s house. We still lived with our parents back then. Matt would take fabric home and cut it then bring it over to me and I’d sew it. We took those products to Greenwich Market and sold them. We worked like that for months. 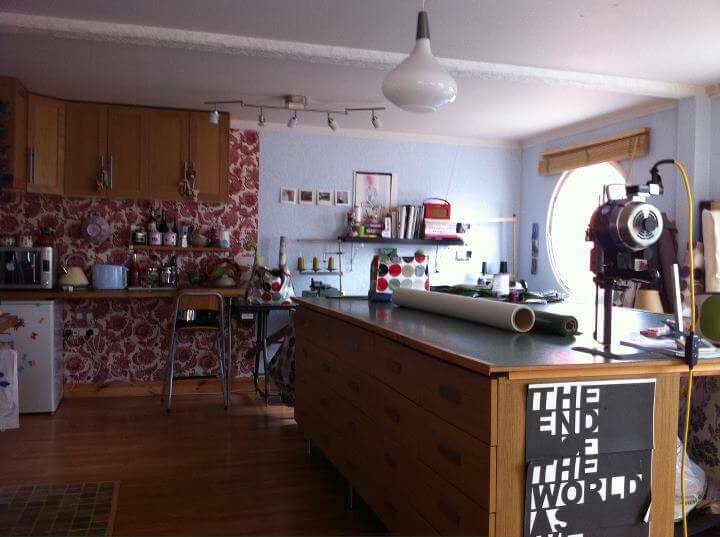 2006 – We opened a studio at Container City down at Trinity Buoy Wharf in East London. It’s run by USM, an incredible organisation that created a unique creative space for small companies like us to develop in. They gave us a lot of support there and we genuinely miss being part of TBW. 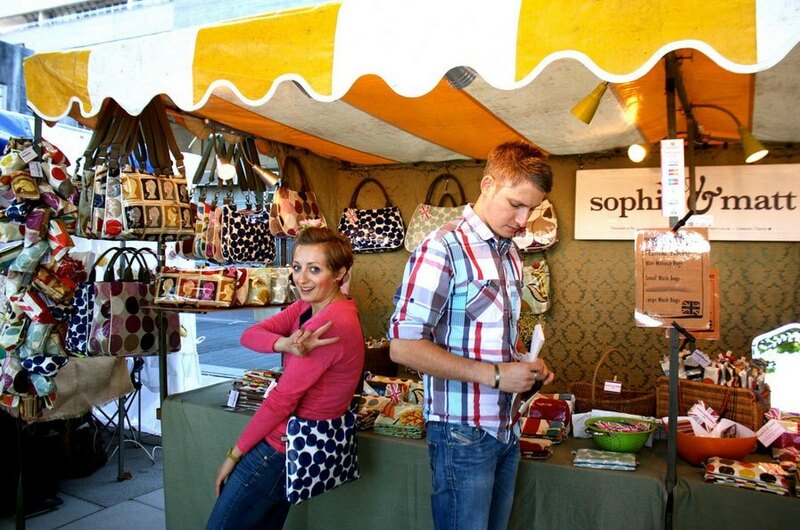 2008 – Sophia & Matt spread into three markets, Greenwich, Camden Lock and Camden Stables. We decided to change the way we worked, outsourcing the sewing of our products to a factory in East London, but decided to keep all the cutting in-house so we could control the production and wastage. 2009 – We had the opportunity to exhibit at a trade show in Japan, with help from our friend, Hiro Koshimizu, who we met at Camden when he was sourcing original design for import into Japan. We sold to stores around Tokyo but it was tough because we were still making a lot of the products by hand and struggled to keep up with demand. 2010 – We opened our first shop in Greenwich, London. We closed the market stalls so we could focus on growing the business via the shop. 2012 – We moved production to China after becoming increasingly frustrated with our suppliers and manufacturers in the UK. 2013 – We launched a huge new collection comprising 13 new products in 5 new prints. We designed everything, the prints, the leather embossing, the hardware and the product design. It took us a solid year to complete all of the work. It was the first production run with our new factory in China and was by far the highest quality products we’d ever produced. 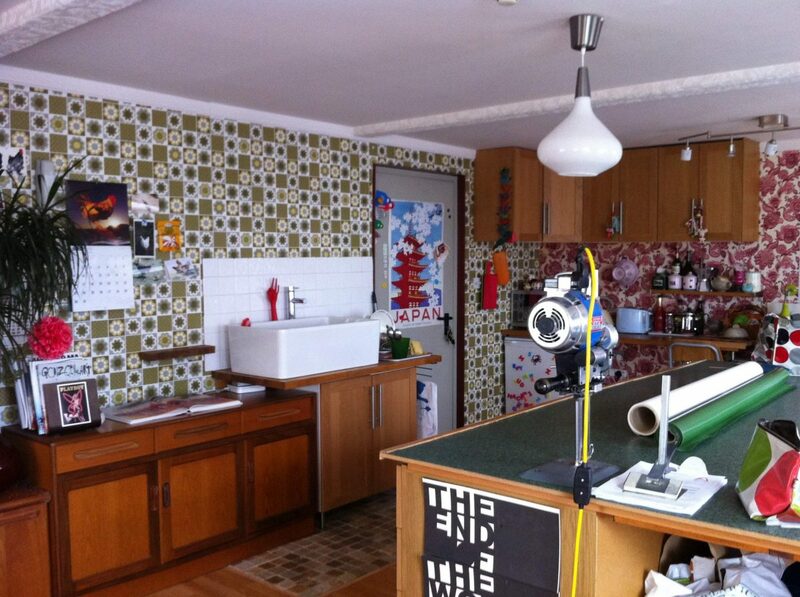 2014 – We started selling our products in Germany with the help of an agent. 2015 – Matt and I moved to Brighton and welcomed little Oskari into the world. That summer we opened a ‘pop-up shop’ on Columbia Road in London and in October 2015 on the company’s 10 year anniversary, we opened a second store in Brighton. 4. Do you design all the fabrics yourselves? 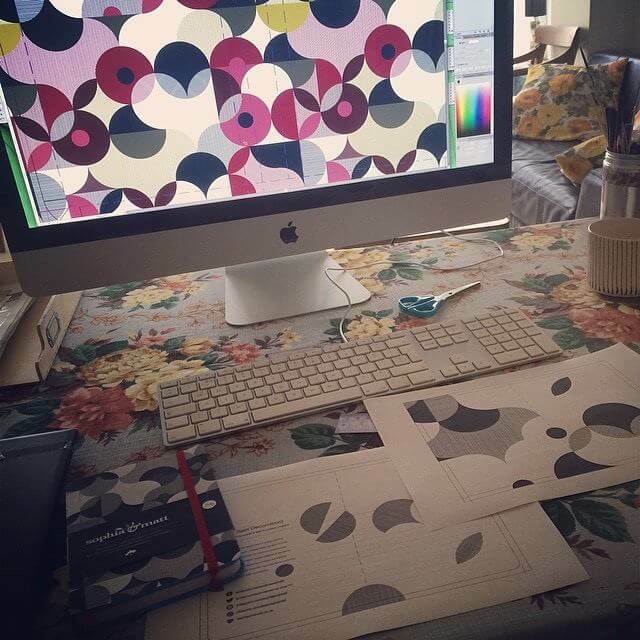 Matt and I design everything single detail for our products: the print, the shape, the metal work. There isn’t a detail we don’t explicitly work on. Some of our prints can take months to finish. For example, our Wild Floral print took 6 months from start to finish but was worth it! We normally start a print by talking about what’s missing from the collection or simply what we would like to see on a product. 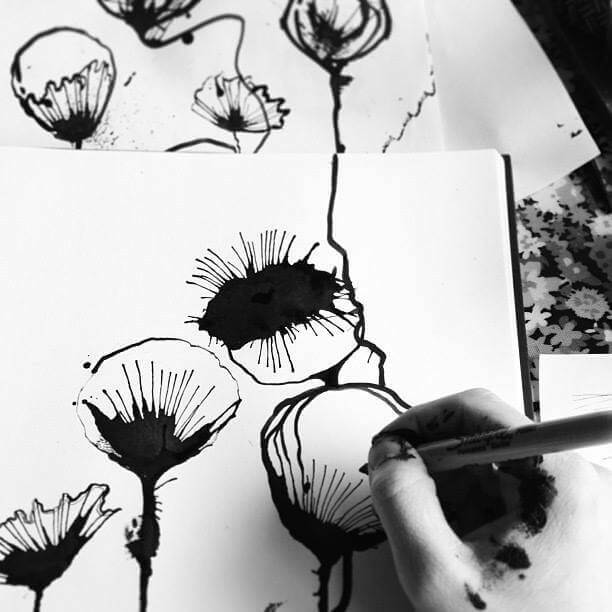 We start off by hand drawing with pen and ink in black and white and once we have all the pieces, Matt will redraw it on screen, usually in Adobe Illustrator. Then it’s passed back to me to colour. 5. What were some of the first items you sold? I will never forget our first sale. It was a Wednesday (which was our first day at Greenwich Market, (you had to do a test Wednesday before you were able to do a weekend) and it was a makeup bag. Our first order was for a handbag. I made it, wrapped it, then hand delivered it to the customer! You would be surprised at some of the things we’ve done to make sure a customer get’s the product in time! 6. 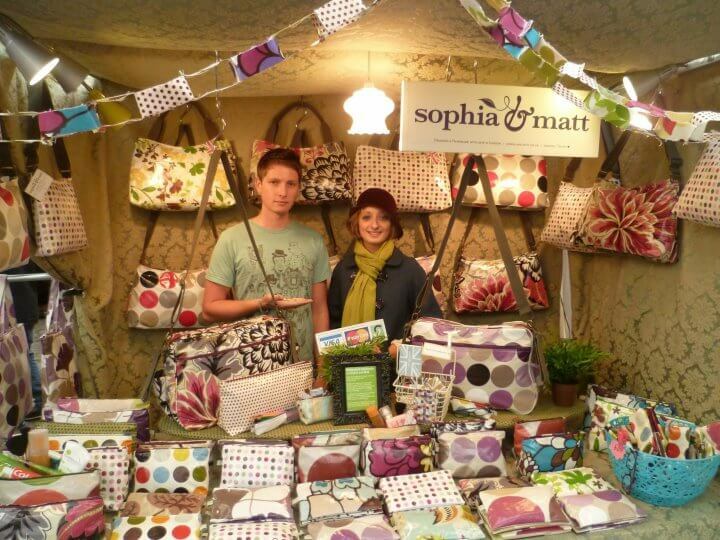 What’s your favourite Sophia & Matt product and favourite fabric design? We are often asked this and it really is hard to answer. We all use our products exclusively, and anyone who works with us is asked to choose a set of products to start using for themselves. 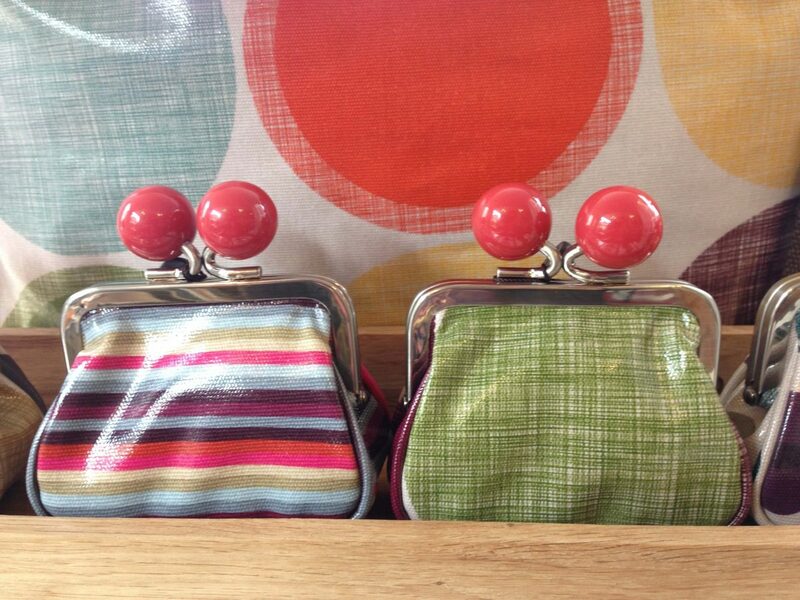 For me, I think it has to be our Clip Purse in our Yayoi print because it was designed with a story behind it. When I was young my Great-grandmother always had a black leather clip framed bag. The frame was gold and shiny. She would keep coins in it and on a visit she would open the bag and let me take £1 for sweets, (when we were kids that got us nearly 100 sweets!). That clip frame looked so big to me because I was small. The first thing we produced in the new factory was an oversized clip frame for a tiny product. 7. What are your best sellers? 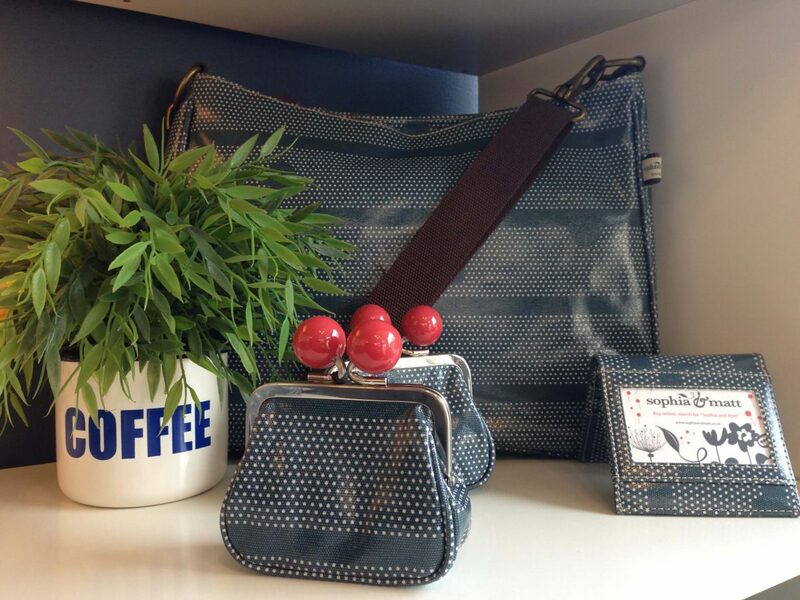 In our accessories, it’s our small wash bag, makeup bag and clip purse. In our bag collection, it’s our shoulder bag and cross body bag. 8. Give me your ‘Elevator pitch’ – what sets Sophia and Matt apart from other companies? When you buy one of our products it really has had the hand of the designer involved from start to finish. We have sold thousands of products over the years and many of those products were hand made by us. 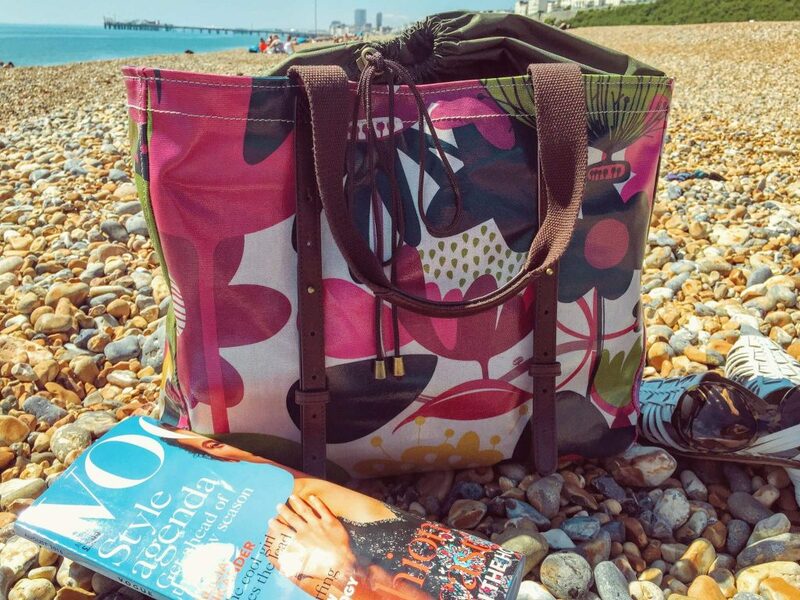 Those that weren’t made by us still started at our fingertips in our flat in Brighton, travelled the world and ended up with one of us personally putting it into a carrier bag at the till point in one of our shops. I genuinely don’t know where else you’d find that in our niche. We have a personal involvement in the day to day running of the company that you don’t often see. We work in our shops serving customers, between designing products and reply to our customers online personally. That’s the story behind our brand and our products. We don’t use marketing companies to connect with our customers or hire print designers to stick stuff on “off the shelf” products. We produce our work ourselves and that’s what our customers get when they buy one of our products. 9. You’ve had a Royal visit. Tell us about that. 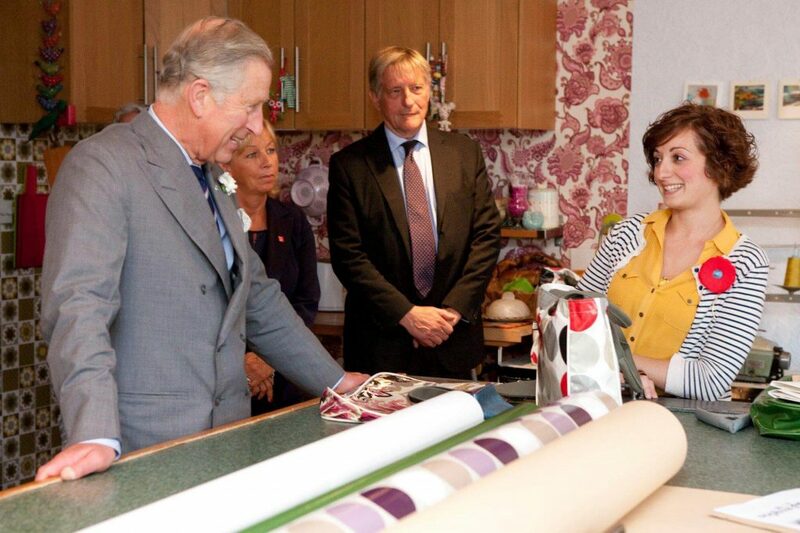 Prince Charles visits the Sophia & Matt Studio and chats to Sophia. Image: Sophia & Matt. The owner of our studio has a connection with Prince Charles. I believe they are involved in some charity work together. The Prince wanted to come and meet a few companies on site and we were asked the day before if we would be available, so errrm, let me think, YEAH! The next day I was up in our studio waiting. I could see him arrive by boat (our studio overlooked the River Thames) and I was on the phone to my Grandmother, Matt, and Mum all at once! He was really nice, he really put me at ease and was very easy to get along with. We actually did have a bit of a laugh together, and I got a great photo for my Grandmother. 10. Have you always worked with coated fabric? We started out working with leather and uncoated fabric. Leather was hard to work with without the right equipment and was expensive to purchase. Regular fabric didn’t hold its shape very well. Printing and coating fabric gave us the opportunity to create surface print and work with a hard wearing material that held its shape. It was perfect for creating wash bags and toiletry bags. 11. Have you ever sold your products through large retailers or department stores? 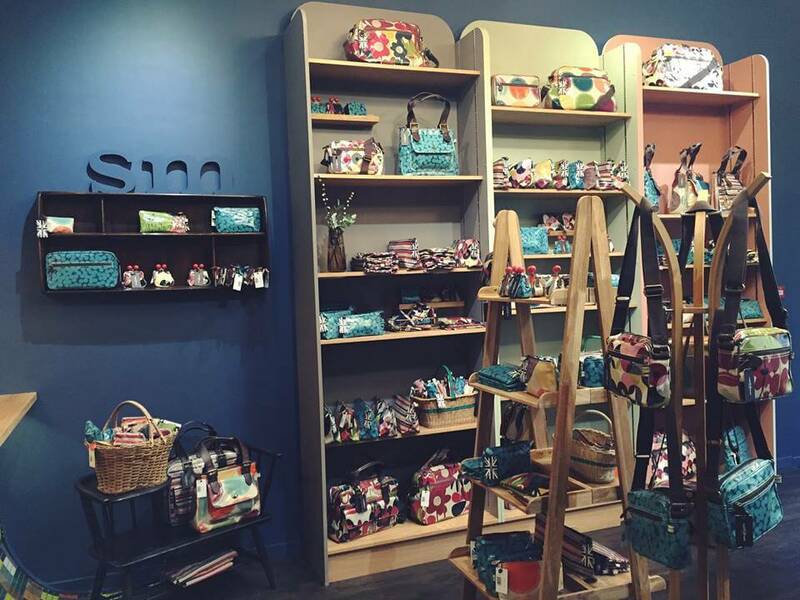 We launched our main collection in Heal’s and sold our changing bags to John Lewis. We did wholesale our collection for a while, (maybe 2 years), but ultimately it wasn’t what we were set up to do. It’s a different style of business and it didn’t suit us. We prefer to sell directly to our customers. We have a relationship with our customers and can offer the people who buy our products a level of customer service you can’t get from a stockist. The other issue is we don’t work seasonally. 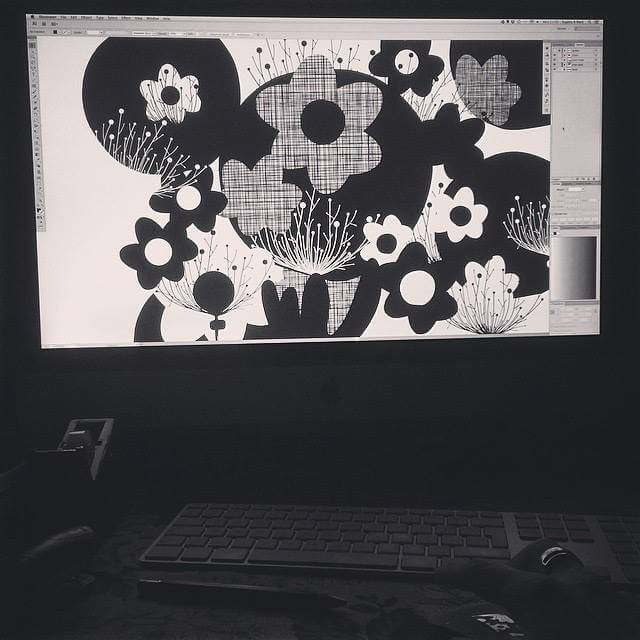 Our new products and prints are ready when they’re ready. However, stockists want new products every season, even if they’ve only placed a small order. This means you’re driven to churn out “new” low quality work seasonally to satisfy stockist demand. Then you have to put all your old stock into sale to “move” it. There’s nothing wrong with that style of business, it’s why a lot of brands hire entire teams of designers to churn work out. But it’s not for us as we’re only interested in producing high-quality work. As our company grows, we may be able to do things at a faster rate. Then we may reconsider whether we should return to supplying stockists. 12. You managed to build up a business organically, with very little marketing. What’s your secret? We owe it all to our customers and the people that have supported us and the business over the years. We’ve worked very hard but without that support we wouldn’t have amounted to anything. When we started out, we were given an entire car load of trimmings and zips by a friend of the family, which helped us get started. USM were a huge part of our start-up years, they rented us studio space and helped us expand our studio as we grew, giving us a lot of support. The same can be said of the market managers at Greenwich market, (Barny, Ben & Alex), and it was Greenwich Hospital that gave us the opportunity to open our first shop. It was actually one of our customers that invested in our company, enabling us to grow even further. Without any of those people, we wouldn’t have made it this far. We made the most of the opportunities offered to us by and dedicated ourselves to creating high-quality work. We look after our customers, and as a result of that attitude, a lot of our growth is down to word of mouth rather than marketing. Have you fallen for Sophia & Matt’s beautiful bags and accessories? Can you see why I was so excited about featuring Sophia & Matt in my Creative Inspirations series? I think you’ll agree, their products and print designs are absolutely beautiful. You can tell that every one of their gorgeous bags and accessories has been created with love and care, right down to the finest detail: from the colourful spot, stripe and floral prints to the design, quality and durability of the final product. Look after them, and Sophia & Matt products will last for years. I’ve had my Sophia & Matt make-up bags for four years and use I them every day. Every now and again, I sponge-clean the linings with warm soapy water so they’re as good as new. 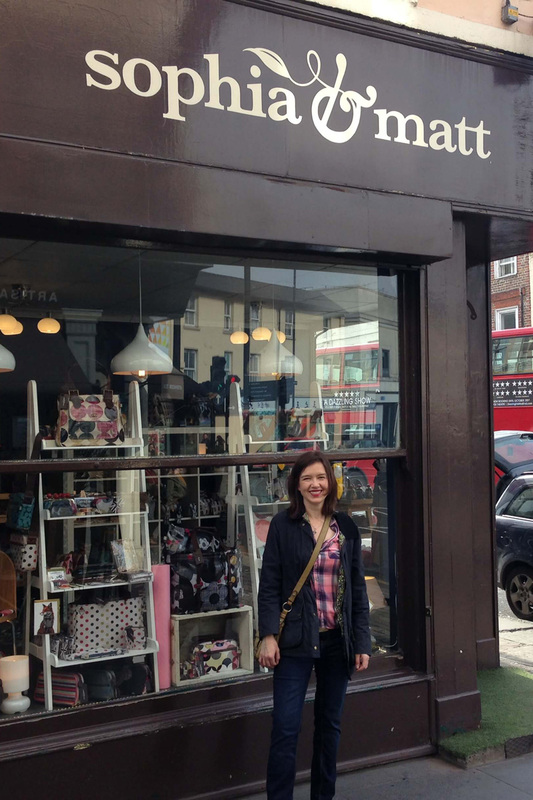 Last year, when mum visited Sophia and Matt’s shop in Greenwich with me, she treated me to a Sophia & Matt baby changing bag. It isn’t just for baby stuff, though, and makes a perfect overnight or weekend bag. Plus, I find the extra straps on the bag, (which enable you to attach it to a pram), are ideal for securing it to the handle on my wheeled suitcase. 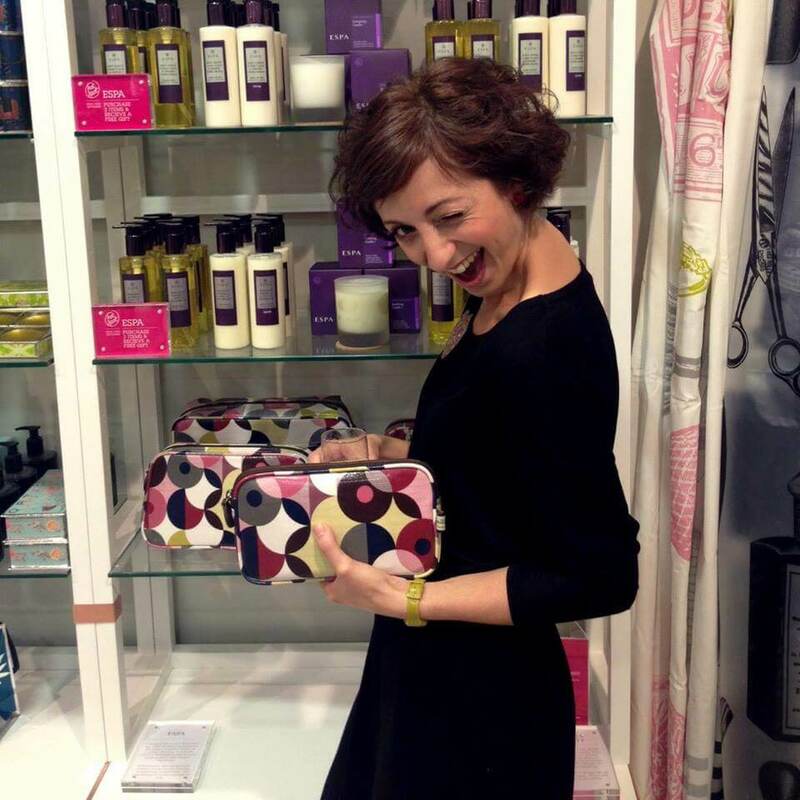 Win a Mainline Makeup Bag worth £25 & find out more about Sophia & Matt in Part 2. 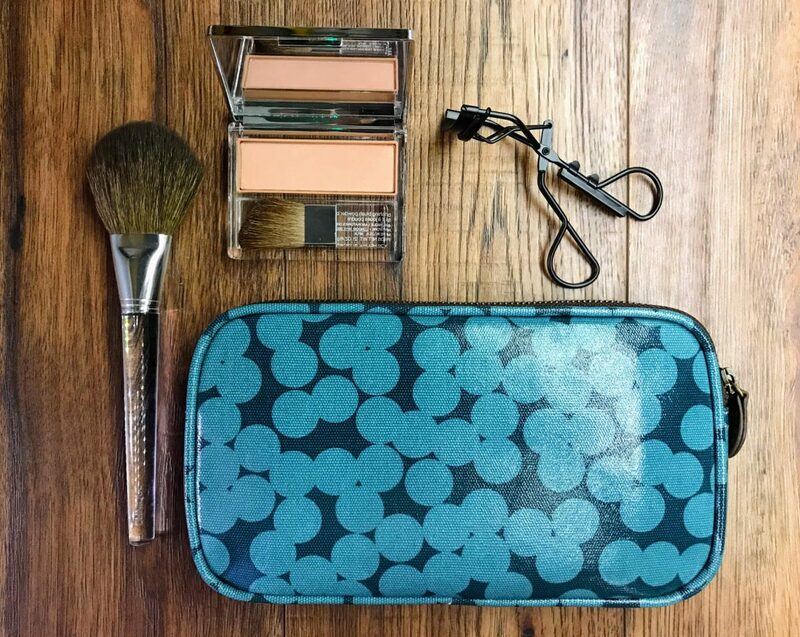 Sophia & Matt Yayoi Mainline Makeup Bag (£25). Image: Sophia & Matt. 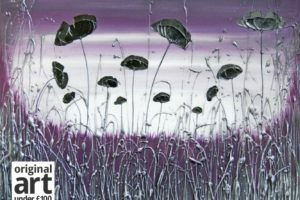 Creative Inspirations: Sophia & Matt Part 2 Plus Giveaway. Have you any favourite items which you use all the time or any favourite designers or prints? What do you think of Sophia & Matt’s bags and prints? 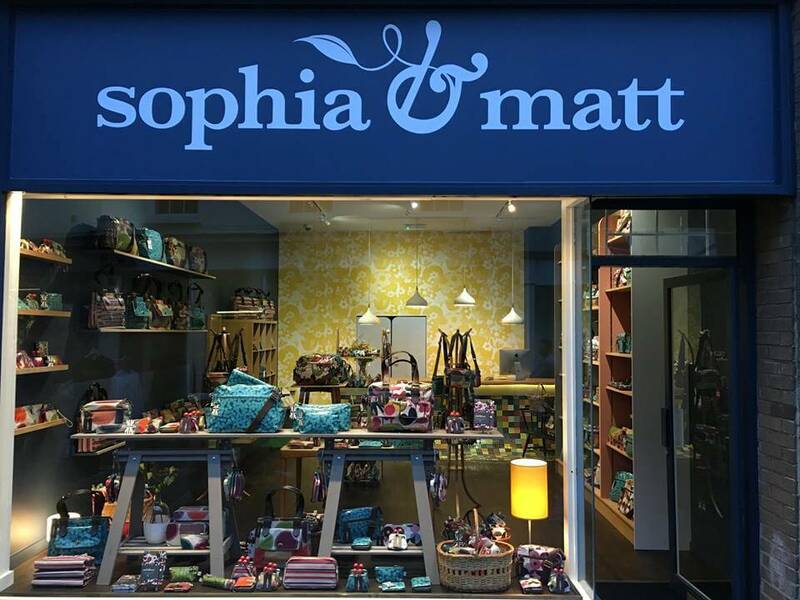 If you’re new to Sophia & Matt and haven’t discovered their wonderful products, why not take a peek at their online shop or follow them on social media? With Mother’s Day just around the corner, they have plenty of fabulous gift ideas for mums. 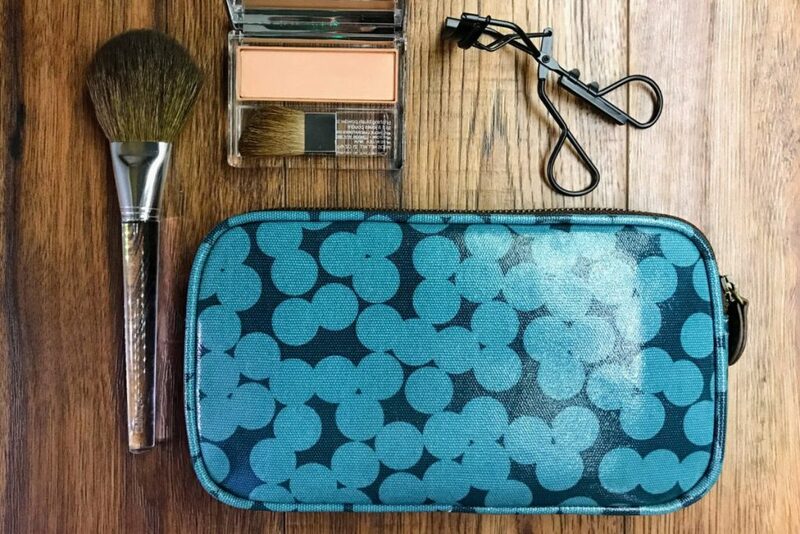 Plus, you can get a free Mini Makeup Bag and free shipping until March 23rd on all bag orders (see website for details). This Creative Inspirations post about Sophia & Matt is not a sponsored post. I just wanted to tell you about their lovely products and share their story with you. Oh, Becky, you’d love it! Such beautiful things. Thanks, Louise! After finding out how hard they’ve worked to build their lovely company I do hope more people discover their beautiful products! Such an inspiring story! Ah, thanks Alex! I really love writing this series and you really must visit them…Then trot down to Greenwich market to see the crafts and delicious food stalls!! Oo I know – I LOVE that market. It’s one of my fave areas and rich hasn’t been yet so it’ll probably be our next trip! I think paying for 3 nights in London and £400 for a pair of 3 day Country Music Festival Tickets for the weekend we visit, makes it a little easier to restrain myself, but not much!!! I spotted your images on Instagram and fell in love this store. Great to see the couple behind the product. They deserve every success! Part 2 gives us even more of a sneak peek behind the scenes! Oh these are right up my street, just my kinds of designs and colours. Thanks Jane! Thanks, Amanda. I love EVERYTHING!!!! They are super talented and SUPER cute! Ah, I’m glad you like their story. They’ve worked so hard to build a business they are passionate about. They have been lovely to collaborate with and I’ve loved reading all their answers for myself. 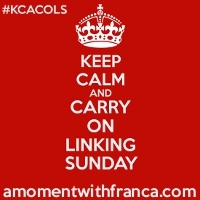 Hope you pop along for part 2 and enter the competition! The designs aren’t for me but you can see the passion and quality they provide. Great post. Insightful. You will LOVE their shop! Thanks for popping by! What lovely products and it’s so nice to see how it all came together. Thanks for commenting and co-hosting, Kerry. I’m really glad you enjoyed their story. I was so excited about sharing it!